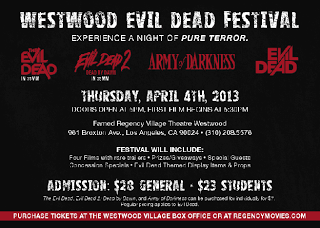 A few weeks ago, we brought you the awesome news that we're hosting an EVIL DEAD MARATHON in L.A. on Thursday, April 4th at the Regency Westwood Village Theatre (961 Broxton Ave, Los Angeles, CA 90024). (GET YOUR TICKETS HERE). Yes, Sam Raimi's original trilogy plus Fede Alvarez's remake, all swallowing your soul in one bloody good night filled with props from the film and stars. What's not to love? Today we're happy to bring along a few exclusive details regarding the Dead-fest: We have our first confirmation on special guests! The lovely ladies of the EVIL DEAD, Theresa Tilly, Ellen Sandweiss and Betsy Baker, will be giving a much desired Q&A after the screening of the first film! They will also be bringing goodies for fan giveaway, so the first film in a glorious 35mm is one not to be missed! Get your TICKETS HERE for further information, and check out and LIKE our official EVIL DEAD MARATHON Facebook page HERE.